From Fine Cooking's current issue no. 84, this oven-fried chicken is from an article on how to prepare boneless skinless chicken with a crispy crust. There are a few recipes all using the technique of coating the chicken in a flavorful sticky saucy mixture and then dredging them in pre-toasted breadcrumbs. The breadcrumbs adhere to the chicken via the sticky sauce. The version I made has asian flavors including orange, soy sauce, and honey in the sauce and sesame seeds mixed in with the breadcrumbs. The chicken is cooked on a rack so that hot air can circulate underneath and prevent the underside from getting soggy. The underside didn't get soggy but it didn't crisp up (or brown) that much either. Still it was OK, since the breadcrumbs were pre-toasted. 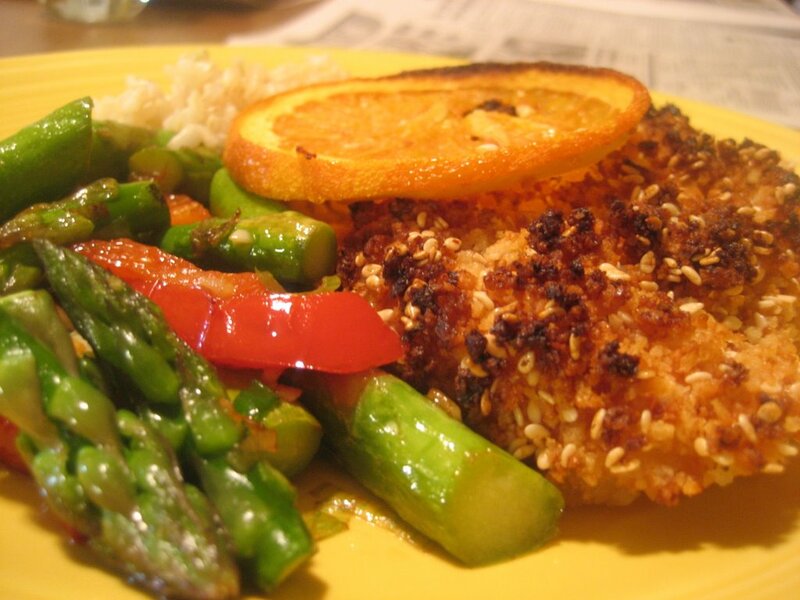 The orange-sesame version also advises to dip some thin orange slices in the sauce and bake them alongside the chicken to provide a tasty, attractive garnish. There is also a jalapeno-cheddar variation that looks good. I'll probably try it soon. I keep meaning to try some of the recipes from that article!